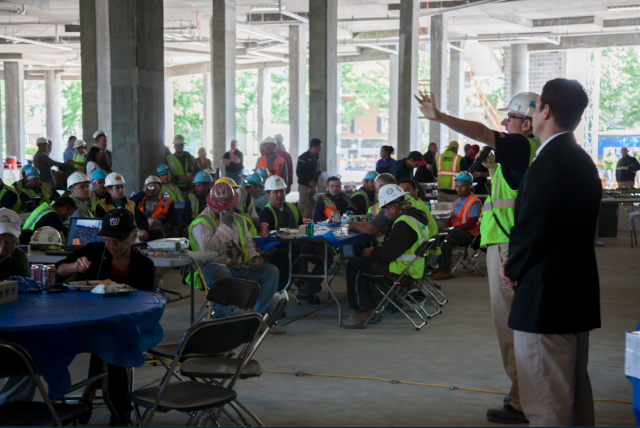 The best parts of life are at the top – and on May 22, we celebrated our “Topping Out Party” at 301 West Broad, where we officially completed the roof on our gorgeous luxury apartments on West Broad. You know what that means – we’re this much closer to opening our doors for you to lease out your dream apartment. In fact, according to Stefan Gassner, a Development Manager on the project, we’re on track to have our first residents move in by January 2016! The subcontractors and consultants have been hard at work designing one of the most breathtaking apartments in Falls Church, VA, and new developments are popping up every day. In honor of their crucial contributions, an impressive roster of Falls Church dignitaries (including City Manager Wyatt Shields and Assistant City Manager Cindy Mester) were present as we thanked the dedicated construction workers (sporting their work gear), and all attendees were provided a free commemorative t-shirt and delicious catered BBQ lunch served up by a local favorite, Famous Dave’s. Our party even made it into the news! The Falls Church News-Press wrote a whole article about the “Topping Out Party” as well. Check out some of the photos of the rapidly-growing West Broad apartments – and get excited! If you’d like to pre-lease, get in touch with us today.